Please, have your screen set at 1024x768 (at least), with your browser set to cover the full screen for a maximum viewing comfort. 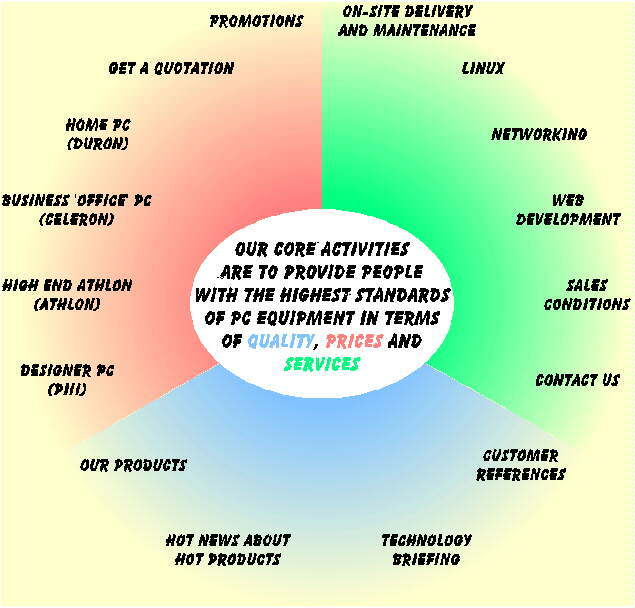 Our core activities are to provide people with the highest standards of PC equipment in terms of quality, prices and services. Have a look at our typical configurations and promo pages. You can calculate a quote to convince yourself that our prices are quite competitive. However, we can also help you to choose the hardware that will best suit your needs, so we highly encourage you to send us as much information as possible about your activities. We'll get back to you as soon as possible. We can deliver you RAID solutions at very competitive prices. - a subtle mixture of both, that should result in the best quality/price ratio for you, depending on the application mix you typically run. However, we strongly think that customers that would be happy in the long-term are the best asset a company can dream of, so we don't usually advise the absolute cheapest components. Nevertheless, if you are sure about your needs, please feel free to ask for that kind of solution. Our products may be delivered to your premises. The delivery is free of charge above 1.500 € in Brussels. All our products are backed up by a full one year warranty. Besides, we can propose you a variety of warranty and maintenance services ranging from the standard one year warranty to on-site maintenance within 8 hours. For your networking needs , we can help to select the best hardware and software combination and install it from the ground up, from cabling (embedded in the wall, ...) up to software configuration in heterogeneous environments. In line with aDOC Services strategy of offering a global solution to its customers, we can also help you to develop your web pages to create your presence on the Internet, or for Intranet applications. If you need a highly powerful UNIX machine, we can provide you a complete solution based on a Linux PC for one half to one third of the price of most of today's UNIX proprietary workstation that would exhibit the same range of performance. We can either fully install and configure Linux on your machine, or let you do the work, and limit our intervention to guaranteeing the compatibility of the hardware with Linux. To allow you to make the best choice, we keep you informed of the latest technological developments, and try to give a global view in our technology briefing section every now and then. To inform you in the most efficient way, we provide you with direct links to products descriptions by the main vendors we sell, not to their main page. This will ease and fasten your browsing. Have a look at some of our customer references and you'll see that we have already worked efficiently in the past with private companies, as well as with administrations and universities.